The SMALL FISHFARM is modular, allowing multiple units to be joined together. 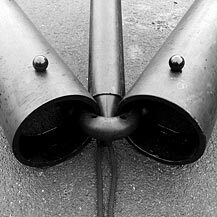 Three polyethylene pipes are fixed in a triangular arrangement, end to end, using rubber corner fittings. They provide the floats that hold the fish nets. Three thinner pipes erected from the corners meet in the center to provide support for the top net while also adding further rigidity to the construction. All the materials are non-corrosive and non-toxic. If one raises species that feed off the sea floor, the net must be open in the bottom. 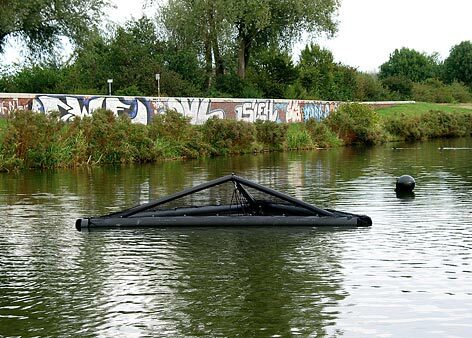 This is the case with this version of SMALL FISHFARM. 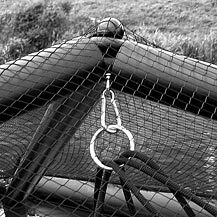 The net is somewhat longer than the depth of the water and is weighed down using heavy steel chains woven along the bottom. 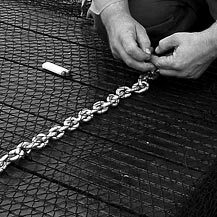 In order to be able to lift it, when collecting all the fish at once, or to check the net for damage, ropes are attached in different places to the end of the net. These can be pulled up through the ring that is suspended at the center of the construction. 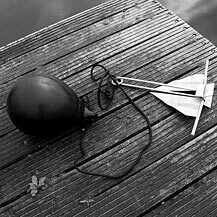 The farm is held in place using three anchors marked with buoys. Mussels can be placed along the bottom, where they will feed off the fish droppings thereby keeping the area cleaner. A large variety of fish can be raised with the SMALL FISHFARM, but some are especially well suited. In addition to one's taste and preferences, the choice must depend on the salinity, temperature and quality of the water. One must also consider the other organisms that inhabit the water, including algae, seaweed, plants, and other fish species. So as to not disturb the trophic system, it is important to use a fish species native to the body of water being considered. Furthermore, some species require maintenance and feeding while others - if the setting is ideal - can be left more or less to themselves. For common carp raised in an extensive culture, successful stocking density is around two fish per square meter of surface area. First stocking size should be a minimum of about 15 cm in length. Although growth rate varies with size, it is fast enough to harvest fish every year as long as they are reproducing successfully. Carp will usually reproduce with one major spawning season per year during spring or summer. The male-female ratio should be about 1:2. Other possible fish species are pike, zander, trout, salmon (these species are mainly carnivorous and will have to be fed), tilapia, catfish, (both of these are very hardy and can live in low oxygen conditions) grouper (marine), milkfish, eel, and many others. The nets are hooked on to the knobs. The chain weighs down the net. Ropes, fixed to the bottom of the net. Fish net, fixed to the construction. 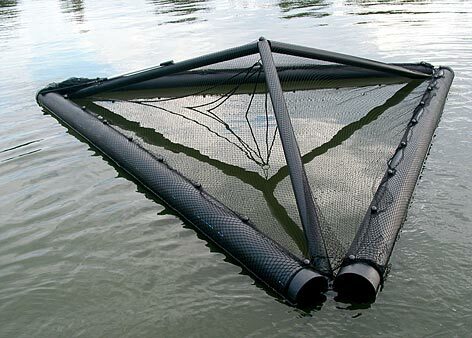 The drawbacks to cultivating any finfish in nets include the fact that the small mesh size required for reproduction will inhibit good water circulation, it will become covered in algae and subsequently respiring bacteria quite quickly, and the bottom will be covered in fish waste. This will also cause the oxygen levels in the enclosure to become low, which can be unhealthy or even fatal for the fish and other organisms. However, by making sure the area of the farm has lots of plants, and by stocking a few fish that eat the algae on the net, this problem can be avoided. Another possibility is to use a larger mesh size in the main area for better circulation, and either restocking each year, or having a secondary breeding area with a smaller mesh size used only for spawning and rearing the juveniles to a certain size. The SMALL FISHFARM can be extended with a small spawning area connected to the main net. The spawning area must provide a shallow, heterogeneous, and protected environment for spawning and for the growth of the larvae and juveniles. In the case of carp, this area must be no more than 30 cm deep and be densely vegetated. The carp will spawn between the plants. The spawning area should have a fine mesh size to prevent the offspring from escaping, however no mesh size is small enough to retain all the eggs and larvae, but this is not a problem because of the abundance of eggs. 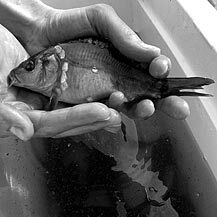 As an alternative to this method, one can move the reproductively mature fish at the appropriate times to an external enclosure where they can spawn. For more intensive breeding, a feeding automat can be added. This requires access to electricity, which can be difficult One solution could be installing a solar panel or a windmill, including a battery to store the energy More SMALL FISHFARM units can be coupled together at the vertices to form hexagonal or rhombic shapes. 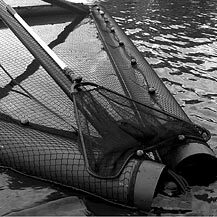 Many fish species will themselves keep the nets clean from algae and weeds by feeding off them. If they don't, some cleansing will be necessary. 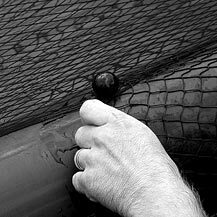 Occasionally, the nets should be lifted and checked for holes and other damage Sick or wounded fish must be removed from the farm The largest adults should be harvested first. 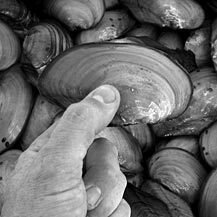 100 pc swan mussels (Anodonta Cygnea).